Album cover, digital release image. 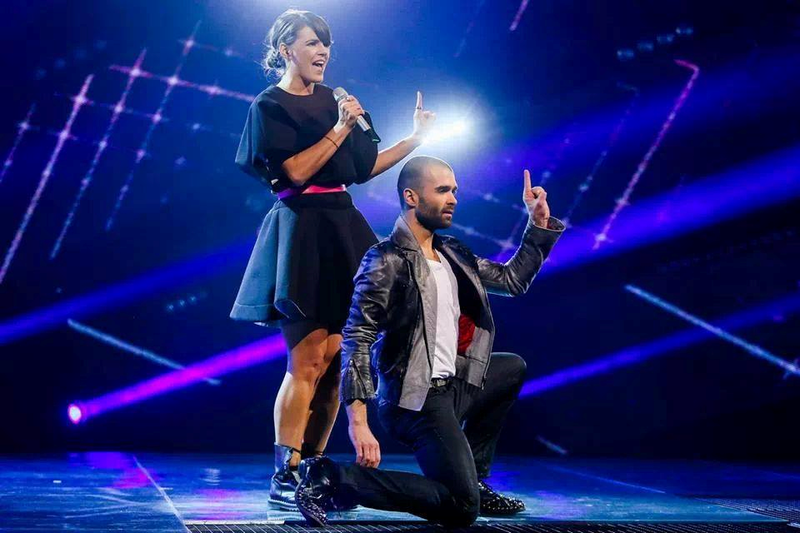 Lithuania held the most elaborate preselection this year, and episodes were even added due to tv-viewers popularity. Songs and singers were selected seperately and they came up with Attention to be performed by three artists in the final. On the final night Vilija Matačiūnaitė was chosen to represent Lithuania in the 2014 contest. The song is written by Viktoras Vaupšas and Vilija Matačiūnaitė. Watch the performance here at LRT's Youtube. Vilija's debut album Attention! is out now in Lithuania on CD and digital through iTunes and Amazon. It includes the Eurovision version and original acoustic version (demo). Full tracklist below. Next to the demo used to enter the song in the Lithuanian NF, there's an earlier studio version (here at YT). - on the official Copenhagen 2CD, CD Attention! Attention - original demo by Vilija Matačiūnaitė. - has been on LRT's website, youtube, on CD Attention! Over the course of the Lithuanian selection the song has been performed live by Vilija Matačiūnaitė, Vaidas Baumila, Mia and Monika Linkyte. Vilija Matačiūnaitė entered the Lithuanian preselection already in 2005 with the much debated Oh My God. The song ended 7th in the final. Lithuania has made it to the final four out the past five contests, but fails to make any waves in the final. Shame really, because there are a few personal favorites there. In 2009 Sasha Son(g) ended 23rd with his multi-language Love. Eastern European Funk by Inculto (2010) was a lot of fun, but it failed. Evelina Sashenko ended 19th with C'est Ma Vie. Best result in recent years is for Donny Montell's Love Is Blind (14th in 2012). Last year Andrius Pojavis was 22nd with his self penned Something. Thanks to Lior and to Jean-François. Oooops, I accidentally deleted a comment sent by Toby Lior Carmel. "There is a first version published January 15th: https://www.youtube.com/watch?v=wuc801IvJqA. The Eurovision version on the compilation CD has added instrumentation. Vocals are the same."